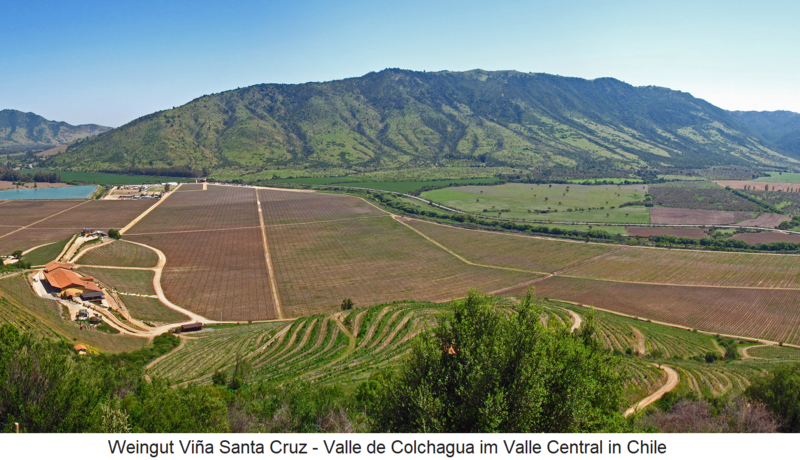 The wine-growing area Valle de Colchagua is 130 kilometers south of the Chilean Capital Santiago de Chile in Valle Central. Together with the similar area Cachapoal it forms the southern half of the Valle de Rapel region. The center is the city of Rancagua, known for its hot springs. Colchagua is flowed through by the Río Tinguiririca, which allows only a winemaking ever. The Mediterranean, hot climate is tempered by cool air currents from the western Pacific. Here, in 1996, the first Chilean wine route "Ruta del vino de Colchagua" was created. A wine-tourist attraction is the train "Tren del Vino", operated by steam locomotive, which travels through the vineyards. This page was last modified at 31 May 2018 at 08:37.